Premenstrual syndrome. If you’re female, it’s something you wish you’d never been acquainted with. If you’re not female– let’s just say, you’d best just stay out of the way during that time of the month. Unless you want serious trouble and possibly a minor injury or two! There have been days when all I could do was lie on the bed, ‘waiting for the storm to pass’. It was a matter of just surviving. All my plans for the day got put on hold because I just couldn’t operate. 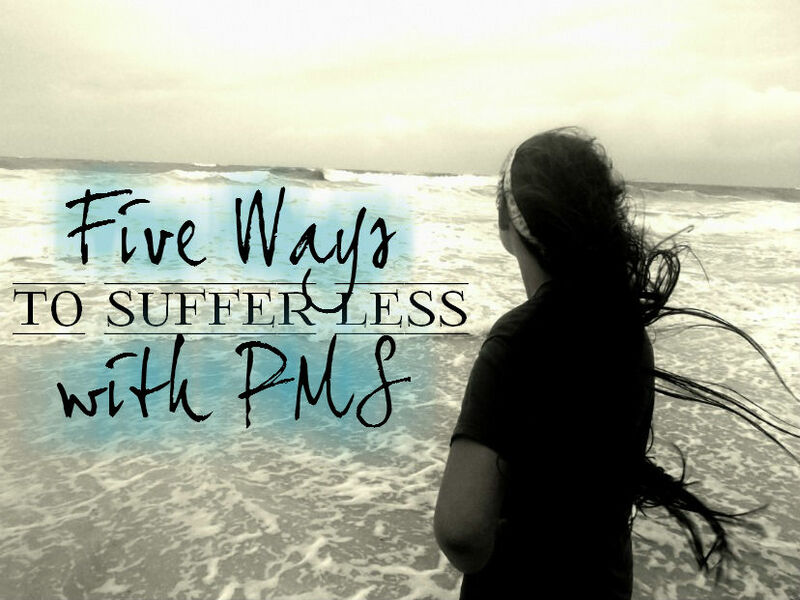 Simply put, PMS has been nothing short of a nightmare for me. But the thing about life is this, it doesn’t just stop and wait for you to get over your physical discomforts. There’s work to be done, tasks to accomplish, and schedules to follow. So what can you do to make that time of month less of a pain – literally? Here are some things that really help with me get PMS relief. I wanted to see if this was true. So for a month, I drank a ton of hot red raspberry leaf tea, several cups a day, minimum. And since red raspberry leaf is also a flu/colds combatant, I figured an immune system boost would be icing on the cake. Well, that time of month rolled around and I waited to see what would happen. Absolutely nothing! No cramps! No excessive bleeding! No pain! It was the easiest period I’ve ever experienced. Ever since then, I’ve been swearing by red raspberry leaf tea. You can find it in the grocery store or in bulk from suppliers online. (My favorite supplier is BulkHerbStore.com.) The key is to drink it consistently and not just during your period so it can regulate your estrogen levels and keep your magnesium/calcium balances where they should be. Rubbing a couple drops of lavender essential oil in your abdomen can bring some localized relief to cramping. It’s well known for removing nervous and muscular tension, and brings a soothing presence which is definitely welcome during periods. Hot baths with lavender oil (five to ten drops) can also be helpful, although dropping everything to jump in the bathtub is rarely an option during the day. If you want to stock up on lavender oil, be sure to keep it, and all essential oils, stored in a cool, dark location. Heating pads can bring instant relief for moderate pain and cramping. Just hold it against the area where it hurts the most. Crafting a simple heating pad is super easy. All you need is an old sock and rice! Fill the sock with rice and tie the end securely. Heat in the oven at a low temperature or in the microwave for a few minutes. You can also buy a purpose-made heating pad. The best medicine is the preventative kind. If your internal balances are off, you will feel the consequences. Make sure you’re eating a balanced diet that provides all the nutrients and minerals you need. Vitamin/mineral deficiencies cause all kinds of ailments and directly affect your cycle negatively. Eat more foods that are high in complex carbohydrates, such as fresh fruits, vegetables, and whole grains. At the same time, reduce or avoid the simple carbs found in sweets and refined foods. Exercise at least three times a week. Do moderate stretching every day to keep the blood flowing and your metabolism awake. Get enough sleep, not just the bare minimum. Every woman’s body is different. What works for me, or your friend, or your mother, might not work for you. It’s vital to pay attention to the signals your own body sends. Connect with how you function, and experiment with different methods and watch how your body responds. Ultimately, only you can determine what works best for you. “Be Your Own Doctor”, Rachel Weaver, M.H. 12 Days of Holiday Giveaways: Day 8, Gifts for the pampered Survival Mom! Release your inner diva! Safety note on the in bath essential oil: While lavender is about the MILDEST essential oil, when using essential oil in the tub, it’s best to mix the oil into a carrier: baking soda, epsom salt, heck even some rolled oats (milk & food grade oils also work here). The other ingredients will add their own benefits, but as a carrier will prevent the essential oil from floating on the surface. Again, not so much an issue with the very very mild lavender, but if you wanted to mix a bit of peppermint (also great for relaxing muscles & acting to increase effectiveness of other oils), the floating peppermint can cause skin irritation. Thank you for that note of advisement, ChickenMama. I’d forgot to mention about mixing the oil into a carrier. I have to say that heat has never worked for me. If I apply heat, it makes the cramping much worse. I’ve had good luck with l-tryptophan – specifically, Lidtke’s L-tryptophan Complete – for my mood. The mix they include in the Complete version works very well. daughter also takes magnesium capsules.. cuts down the migraine, too. I’ve heard that using reusable pads (i.e. “mama cloth”) can help alleviate menstrual pain and excessive bleeding. I’ve tried some and found them to be extremely comfortable, if nothing else, and had a lighter/ less painful period. =) After having a few children, my cycles don’t seem to be as bothersome anyway. I used to have horrible “stay in bed (or the bathroom…) for a day” periods. Something called “cramp bark” cream rubbed on the abdomen helped, too. Good luck with your PMS! One cup of raspberry leaf tea when I first felt my period coming on was a god send for me. I have recommended it to all my friends. They thought I was crazy until they tried it. I always purchased mine at the local grocery store. I always found it to be very sweet even without sugar. Sometimes it was hard to finish the entire cup but I did because I knew the benefits. In the summer I would sometimes drink it as iced tea.